Dating to around 1915, this is a fine example of the relatively rare Brical Money Calculating Machine, complete with its original leather bound blue velvet & silk line case, and one stylus. Engraved on the face 'The British Calculator, (Model B) For Compound Addition, Patent' The serial number on the side is 251 and also marked 'T.J.MARSHALL & CO. Mufrs'. Made to add £sd cash amounts together, the stylus is inserted at the number desired and then moved clockwise (as indicated by the stamped arrow) to the end of the slot. This movement of the toothed ring advances the total as seen in the four result windows, and the carry operation between all rings is automatic. Clearing the calculator is done manually for each toothed ring which has a red tooth as a visual indicator of the zero position. Beginning with the outer ring, the operator slides the red tooth fully clockwise and repeats for each ring working inward. The calculator is in very good condition and in good working order, although the outer case does have some covering missing on the underside (see photos). Measuring 13cm in diameter it's deceptively heavy, weighing just over 600 grams with its case. A good working example of an Otis King's model 'K' type C cylindrical slide rule calculator with black on white scales. It carries the serial no Z4195 and has very clean & legible helical scales enabling numerous mathematical calculations, the patent no is 183723 with scale 414 on the bottom, & 423 on the top. Made by Carbic Limited London in the late 1960's, it's in very good cosmetic condition with the black and chrome sleeve having no paint or plating loss. In good working order it comes with its box and the 8 page instruction booklet which is complete but does have some sellotape keeping it together, plus a copy of a marketing leaflet. A fine example of a Fowlers Textile Calculator Short Scale Type manufactured in Manchester between 1920-1940. Measuring 65mm in diameter, it comes with the steel backplate hand inscribed P.W.C. with the serial number 16226 and is in full working order. In very good condition, with clean scales and a chip free glass face, it comes in its original special blue velvet lined presentation case which measures 73mm square, and is hand inscribed P.W.Clark on the back. There is also a modern velvet drawstring pouch supplied for added protection. A Fowlers Universal circular calculator, this is one of the rarer models with a chrome backplate. It comes with its comprehensive instruction book, which includes on the inner cover a dedication from William Fowler to his son Harold Fowler. Dating to the 1930's, it's in full working order, and the six scales perform numerous mathematical functions including multiplication, cube roots and and square roots. Measures 90mm in diameter, and in excellent condition (nice clean dial) with its original leather case which is also in very good condition. Made by Carbic Limited London in the early 1960's, this Otis King cylindrical calculator is a model 'L' type C series. It has the patent no 183723 with scale 429 on the bottom, & 430 on the top, with the serial number W0924 and is in excellent cosmetic condition. All scales are in clean, legible condition and free of any scuff marks, the black and chrome sleeve body is also in fine condition with no paint or plating loss. In good working order it comes with its numbered box, and the original 8 page instruction booklet, plus a copy of a marketing leaflet. 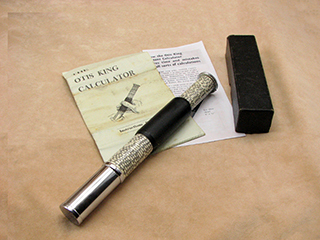 This example of an early Otis King's cylindrical slide rule calculator has the rarer white on black scales. Made by Carbic Limited, 51 Holborn Viaduct, London EC1, this particular example has the serial number 6418 prefixed by the letter A, showing it to be one of the earliest models dating between 1921-1923. It's a model 'K' type A with mostly clean legible helical scales but there is some scuffing on the lower part of the 414 scale, see photos. The patent no is 183723, with scale 414 on the bottom, 423 on the top, and has the key chain loop on the top cap. It comes in its Otis King branded leather case which is in good condition with some small tears on the top flap. It carries the serial no Z3389 and has very clean & legible helical scales enabling numerous mathematical calculations, the patent no is 183723 with scale 414 on the bottom, & 423 on the top. Made by Carbic Limited London in the late 1960's, it really is in excellent cosmetic condition with the black and chrome sleeve having no paint or plating loss. In good working order it comes with its box and the 16 page instruction booklet, plus a copy of a marketing leaflet. This is a nice condition 1930's Fowlers Universal circular calculator, in a special blue velvet lined presentation case, along with its original instruction booklet. In full working order, the six scales perform numerous mathematical functions including multiplication, cube roots and and square roots. The calculator measures 90mm diameter has a nice clean dial, and all is in very good condition including the presentation case. It has a black hammer finish steel back plate which is free of any dents or blemishes, and is a fine collectors item. A rare example of a meteorological pilot balloon slide rule MK 5 model dating to the 1960's in its original fitted case with a copy of an instruction leaflet dated August 1950 for the MK IVa version from the Meteorological office, Air Ministry. Pilot balloon sliderules rarely come up for sale as the majority were produced mainly for the use of Govenment agencies, consequently very few found their way into private collections. This is a large slide rule measuring 24.5" in length and weighing just under 1.4 kgs in its wooden case, and as can be seen from the photos is in exceptional condition. Made by Carbic Limited London in the early 1960's, this Otis King cylindrical calculator is a model 'L' type C series. It has the patent no 183723 with scale 429 on the bottom, & 430 on the top, and is in excellent cosmetic condition. In good working order it comes with its original box and a duplicate 8 page instruction booklet, plus a copy of a marketing leaflet. In full working order, with the serial number U3800, the helical scales enable numerous mathematical calculations, all detailed in the supplied instruction booklet. This is a 1950's Otis King Model L type B/C hybrid series as indicated by the white dimple, with the serial number R4206 and 'Made in London' marked on opposite ends. Made by Carbic Limited London, the patent no is 183723, with scale 429 on the bottom and 430 on the top, this particular example is in good order with all scales in very clean, legible condition and free of any scuff marks. The black and chrome body is also in good condition, with only minimal paint loss on the black sleeve. It comes in its leather carry case with a duplicate 8 page instruction booklet, plus a copy of a marketing leaflet. In full working order, the helical scales enable numerous mathematical calculations. A nice condition 1930's Fowlers Universal circular calculator, in a special blue velvet lined presentation case. It has a black hammer finish steel back plate which is free of any dents or blemishes, and is a good collectors item. A fine example of a Fowlers Textile Calculator Type B manufactured in Sale during the 1940's. Measuring 87mm in diameter, it comes with the black hammer finish steel backplate, and is in full working order. In very good condition, with clean scales & a chip free glass face, it comes in its original special blue velvet lined presentation case which measures 120mm x 110mm, along with its original instruction booklet. It carries the serial no U9813 and has very clean & legible helical scales enabling numerous mathematical calculations, the patent no is 183723 with scale 414 on the bottom and 423 on the top. Made by Carbic Limited London in the early 1960's, it really is in excellent cosmetic condition with the black and chrome sleeve having no paint or plating loss. In good working order it comes with its original box, and although the 16 page instruction booklet has some small pieces missing on a couple of sheets, and has been sellotaped in several places, the majority of the pages are still usable. This is a quite unique circular calculator which first appeared as an article in Fowler’s Mechanical Engineers pocket book of 1898. Although the calculator was sold through W H Fowler’s Scientific Publishing Company it’s not clear who designed it or where it was made, although it’s widely thought to be of Swiss manufacture. The large milled crown rotates the whole dial, with the side knob controlling the pointer needle, and “SCIENTIFIC PUBLISHING COMPANY, MANCHESTER” is printed on the scale surface. Fowler’s did not start producing their range of calculators until 1908 and it’s likely some of their designs were based on this first model. The bevelled glass cover is free from any chips or gouges and the nickel plated case does not have any dents. The card scales are also very clean and legible. A very rare calculator measuring just over 2” in diameter not including the crown & stem, it is in good condition, and also full working order. Dating to the late 1930's, this is the Fowler Magnum Long Scale calculator designed mainly for engineers, and consists of a series of concentric circular scales. It was the largest of the Fowlers range before the Jubilee Magnum came along in 1948. In very good condition, with clean scales & a chip free glass face, it comes in a special blue velvet lined presentation case, and the original 36 page instruction booklet. In full working order, it has a chrome backplate which is free of any dents or blemishes, and measures 120mm in diameter. A good early example of an Otis King's model 'K' type B cylindrical slide rule calculator with black on white scales. It carries the serial no 1111P and has very clean & legible helical scales enabling numerous mathematical calculations. The patent no is 183723 with scale 414 on the bottom, & 423 on the top. Made by Carbic Limited in the early 1950's, it comes with a 1953 Carbic receipt for a cursor replacement, and the original 8 page folded instruction leaflet showing the 171 Seymour Place address. In good working order the chrome plating is in excellent condition as is the black finish on the metal barrel. This Type H calculator is one of the rarer models of the Fowlers circular slide rule range, being one of the first of the range of double sided slide rules that Fowlers introduced in the first quarter of the 20th century. Dating to around 1920 the type H model followed on from the Scientific Publishing Co Fowler’s Patent Pocket Calculator which was patented in 1910. The calculator measures 68mm in diameter not including the stem & ring, and as can be seen from the photos is in very good cosmetic condition with some minor nibbling on the metal edge, which is only noticeable on close inspection. The card scales are very clean and legible, and the glass is clear with no chips or damage. This is a particularly rare calculator numbered 3498 on the outer edge, in good working order and comes in a modern soft pouch for protection. 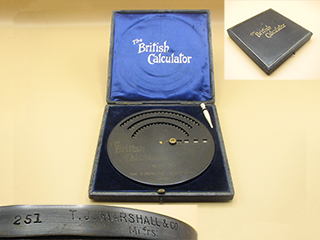 This is one of the rarer models of the Fowlers circular slide rule range. Patented around 1920 the RX was one of the first range of double sided slide rules that Fowlers made in the first quarter of the 20th century. Introduced alongside the type R & type H models, it consists of the front dial of each of those and was thought to be a good compromise for both science students and draughtsmen. The Fowlers RX calculator measures 67mm in diameter not including the stem & ring, and as can be seen from the photos is in good condition. The card scales are very clean and legible, and the glass is clear with no chips or damage, the serial number 3431 is engraved on the outer edge. In full working order, it comes with its original nickel plated outer case which although tarnished in places, is in sound condition. A nice clean example of a Fowler's double sided Long Scale calculator, contained in its purple velvet lined nickel plated case with the original Fowlers trademark logo on the inside of the lid. Known also as a 'Vest pocket' model, these double sided calculators were recommended as the most comprehensive and accurate pocket calculator ever made, and this particular model dates to the 1930's. In very good condition, it measures 2 1/2" diameter and is in good working order, with very clean scales on both faces. One side reads 'Fowlers Calculator' and the other 'Fowlers Long Scale Calculator' with the serial number 12344. It carries the serial no A0633 and has very clean & legible helical scales enabling numerous mathematical calculations. The patent no is 183723, with scale 414 on the bottom, & 423 on the top. Made by Carbic Limited, the 54 Dundonald Road address shows it dates from 1963 onwards, and comes with its original instruction booklet which although a little fragile is still complete. The chrome plating is in excellent condition as is the black finish on the metal barrel. Please note that the box is somewhat worn in places and has been previously taped to maintain integrity. This is a rare opportunity to buy a piece of TV memorabilia with this superb condition Fowlers Universal circular calculator in a special blue velvet lined presentation case, which was used as one of the props in the 5th series of Celebrity Big Brother in 2007. It featured in the Manor House task and was used as an object of interest by the celebrities in the show which included Jermaine Jackson, Shilpa Shetty, Dirk Benedict and the late Jade Goody. I supplied a number of vintage and antique instruments for the task through my website, of which this was one directly to Endemol the TV company who produced the programme for Channel 4, and this will come with a copy of the hire agreement which is signed by their representative. The calculator measures 9cm diameter has a nice clean dial, and all is in very good condition including the presentation case. It has a black hammer finish steel back plate which is free of any dents or blemishes, and is a true collectors item with the added interest of having featured in a high profile TV show. Designed in 1948 by Harold Fowler to mark the 50th anniversary of the founding of the firm by his father William Henry Fowler in 1898, this is the Fowler's Jubilee Magnum Extra Long Scale calculator. This was the largest circular calculator made by Fowler's measuring 12cm in diameter, and it has a 79" long scale extending over ten circles. In full working order, it has a black hammer finish steel backplate, and clean legible scales inside a chrome outer body which is in good condition with some chrome loss around the outer edges. It comes with its leather case which is in good sound condition & original instruction booklet. Dating to the late 1930's, this is the Fowler Magnum Long Scale calculator designed mainly for engineers, and consists of a series of concentric circular scales. It was the largest of the Fowlers range before the Jubilee Magnum came along in 1948. In very good condition, with clean scales & a chip free glass face, it comes in a special blue velvet lined presentation case, and is in full working order. It has a chrome backplate which is free of any dents or blemishes, and measures 120mm in diameter. 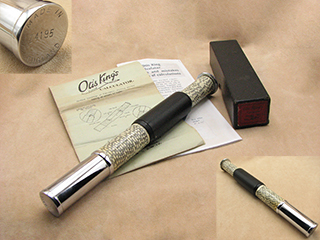 A fine example of a vintage Otis King cylindrical slide rule calculator complete with its box, instructions and original leather case. 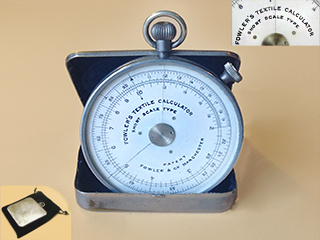 This is a type C, model 'K' serial no W8549, with very clean & legible helical scales enabling numerous mathematical calculations, all detailed in the original instructions which are also included. The patent no is 183723, with scale 414 on the bottom, & 423 on the top. Made by Carbic Limited London during the 1960's, it really is in very good cosmetic condition with the only blemish being some light verdigris spotting on the black metal casing, and is in good working order. In good working order, with clean scales, in a chrome pocket watch style case which is also in excellent condition. This is a nice condition Muldivo Mentor pinwheel calculator incorporating 10 digit setting register, 16 digit results register, and 8 digit revolution register, also has a back transfer mechanism. Model WSR 160, serial no 224415, made in Germany by Walther, this is a quality calculator, the pinwheel mechanism being machined from brass. Not only a great conversation piece, but an unusual retro piece from the late 1950's which is becoming increasingly difficult to find, particularly in such good condition. In full working order, overall dimensions, 11" x 6", weight around 6kgs, overseas buyers please email for shipping costs. A vintage mechanical calculator made by Atvidaberg - Facit in Sweden. The model is the C1-13, this particular design was produced between 1960 - 1964 and the serial number 799433 allows us to date it to 1961. It has a 10 digit keyboard with 8 digit counter and 13 digit accumulator. Cosmetically there are signs of wear and tear, with some paint loss, and a small crack in the results window (see photo 4, the crack is just before the number 3). However, it is in full working order, although the tips of the plastic indicators are missing, but the slides still work and do not affect the operation of the calculator. This is a heavy item at around 6kgs, and measures overall width 11.5" x 7.5"depth x 6" high. Nice condition Muldivo Pinwheel calculator incorporating 12 digit setting register, 18 digit results register, and 10 digit revolution register, serial no DER 160648. Similar to the Mentor in that it's fitted with a back transfer mechanism, This transfers the number in the result register, centre right, to the setting register, centre, which can be very useful in chain calculations. Probably made by Thales in Germany this calulator is in full working order with original plastic dust cover, and dating from the late 1950's. Overall dimensions, 11" x 6", weight around 6kgs, overseas buyers please email for shipping costs. Fowlers Magnum Textile circular calculator, measures 12cm diameter, in very good condition and in leather case which is also in fine order. Also comes with its original 42 page instruction book which although a little dog-eared is complete and perfectly useable. Dating to around 1950, its becoming increasingly more difficult to find these items in such good and complete condition. Original Odhner pinwheel mechanical calculator. Grey metal case, made in Sweden, serial no 1049 - 52417. In good condition with only minor paint loss. Dating to around 1960, these are rapidly becoming must have desktop accessories, as well as collectables. In full working order this is a heavy item weighing over 6kgs! Overseas buyers please email for cost of shipping. This is a vintage mechanical calculator made by Atvidaberg - Facit in Sweden. The model is the NTK which was produced between 1954 - 1957, and the serial number 473672 allows us to date this particular one to 1955. It has a 10 digit keyboard with 8 digit counter and 13 digit accumulator. In very good condition and fully working, this is a heavy item at around 6kgs, and measures overall width 11.5" x 7.5"depth x 6" high. Overseas buyers please email me for shipping costs.